Today we are going to discuss the advantages and disadvantages of buying a new construction home vs a previously-owned home. If you’ve been thinking about moving, you have probably considered both options. We have some great tips to share with you today to help make the decision a little easier for you. There are many benefits to buying a newly built home. For one, the builder will use the latest designs which will give your home a very modern feel, without having to do the work yourself. New homes also have great warranties, with most repairs being covered for the first year or so you own the home. That warranty will make your life much easier, especially with the stress of moving still looming over your head. Another advantage to buying a new home is that builders often have deals in place with mortgage professionals to create special financing packages for you. Conversely, previously-owned homes have great advantages, too. These homes have their own unique character that is difficult to replicate. In addition, older homes are typically found in more mature neighborhoods, with wonderful landscapes, large trees, and common areas to enjoy. We also typically see previously-owned homes offer more features, at the same if not less price per sq. ft. than new construction. So, what’s right for you? It depends on you, and your lifestyle. 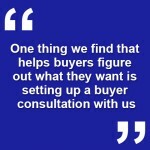 One thing we find that helps buyers figure out what they want is setting up a buyer consultation with us. We can get together, go over your needs, and help guide you on what’s a good fit for you and your unique needs. If you have any questions about how we can help or would like real estate assistance of any kind, we are here to help! Just give us a call or send us a quick email.